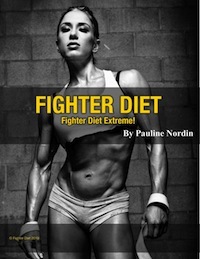 Fighter Diet Extreme was created by Pauline Nordin, a top international fitness model. Says Nordin, “Fighter Diet is my concept for making the impossible possible: getting lean, and staying lean, but not feeling like you are constantly starving! Her program has a lot of rules and she says that is one of the most extreme lifestyles you can choose, but claims that it is also very effective. She developed it due to her personal requirements for a diet solution that would help her to stay in contest-shape all the time. The concept of Fighter Diet Extreme involves restricting carbohydrates on six days of the week, with a carbohydrate “re-feed” on the seventh day. This allows you to lose weight, while maintaining your muscle mass and boosting metabolism. There are three different meal plans that comprise the diet. On six days of the week you follow Plan A, where all of your carbohydrates come from vegetables with an option for small amounts of grains like oatmeal or wheat bran. On the seventh day you follow Plan B, where almost all calories come from high calorie carbohydrates like rice, bread, pasta, oats, cereal and fruit. Plan C is an optional plan where you can consume more healthy fats and take a break from fibers. This plan is good for when you are traveling or want to keep your stomach flat. On all of the plans you should consume 1.25 grams of protein per pound of body weight (not including the proteins found in vegetables). Menu plans are set at 1100 and 1500 calories. Nordin says that most women lose weight on the 1500-calorie plan but if you want even faster results or have a sedentary lifestyle you can try the 1100-calorie plan. Dieters who have a high metabolism and need more calories will need to individualize the diet and include a higher intake of high-energy foods like nuts, legumes and higher calorie vegetables. The fighter diet can be used by men too. Nordin advises men to double breakfast and lunch amounts in order to address their higher calorie requirements. The book includes menus for the plans at different calorie levels as well as lists that allow you to exchange menu items. For example, if you don’t like a food, such as green beans, you can exchange them for any of the other acceptable vegetables, or you could switch one protein like egg whites for a serving of chicken or seafood containing the same amount of protein. Egg whites, cottage cheese, chicken breast, salmon, whey protein, almond milk, green beans, cucumbers, broccoli, flax seeds, wheat bran, non-fat Greek yogurt, Shirataki noodles, cinnamon, mustard, balsamic vinegar, cocoa powder, stevia. Exercise is an important part of The Fighter Diet Extreme and involves a combination of cardio and weight training. Stretching is also included because it reduces stiff muscles, which can help prevent injuries. If you are just getting started with a fitness plan you will do 30 minutes of cardio three times a week, as well as a full body weight training workout two or three times a week. Advanced exercisers will do high intensity cardio six days a week and for the weight training workout will split the body into four or five days. Fighter Diet Extreme is available in eBook format for $26.99. Will appeal to dieters that prefer to follow a structured meal plan. High protein diets can help to reduce appetite. Once a week re-feed can assist with maintaining the motivation to stick with long-term dieting. Very strict and limits the intake of many healthy foods such as fruit, whole grains, root vegetables, legumes, nuts and avocados. Dieters may experience digestive discomfort when first starting the diet due to the higher intake of fiber. Requires the use of nutritional supplements including whey protein and fish oil. Not suitable as a lifestyle approach to healthy weight management. Would appeal mainly to women. Fighter Diet Extreme is a bodybuilding style eating plan that limits carbohydrate intake for six days of the week, with a carbohydrate “re-feed” on the seventh day. It will appeal to highly motivated dieters who are interested in attaining a lean and muscular physique. Agree with review. Would like to add that their management bullies and harasses people that provide any negative feedback on their websites until the person deletes the review. Unprofessional.